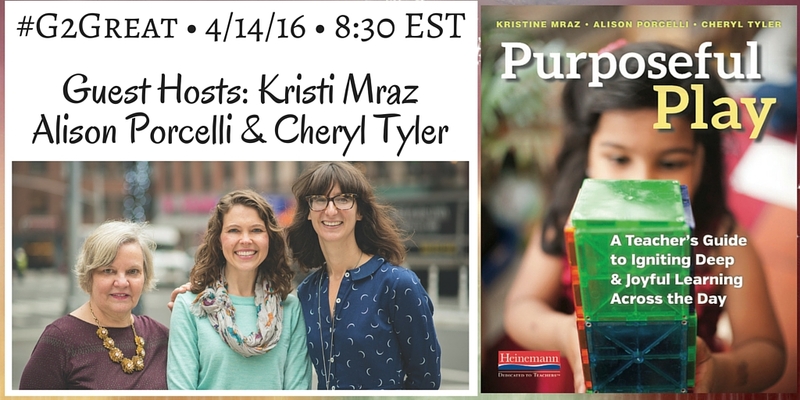 On April 14, 2016 #G2Great welcomed guest hosts Kristi Mraz, Alison Porcelli and Cheryl Tyler, authors of an amazing new book, Purposeful Play: A Teacher’s Guide to Igniting Deep & Joyful Learning Across the Day. Their personal commitment to the topic is evident from the first page with the words that implore us to take action: ”Play isn’t a luxury. 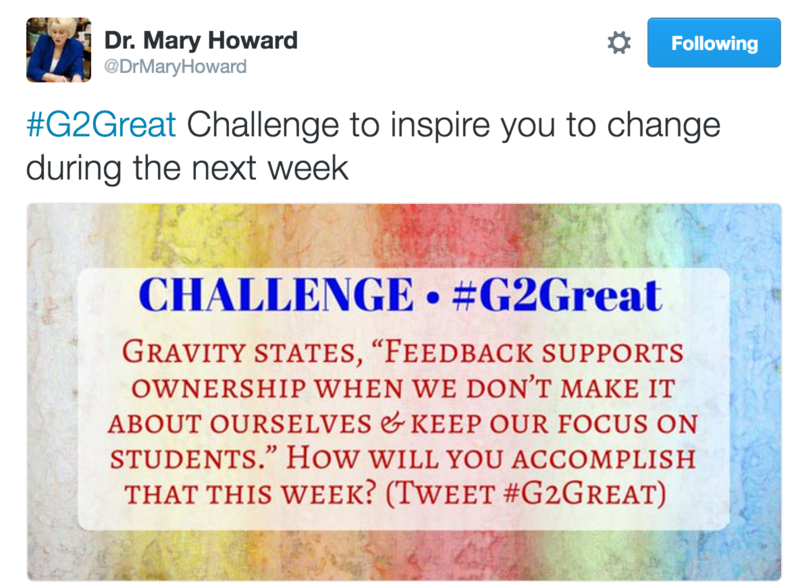 It’s a necessity.” This message quickly reverberated across Twitter in a celebratory ripple effect of newfound appreciation for purposeful play as #G2Great moved into trending overdrive. As it turns out, research supports our collective enthusiasm. Dr. Stuart Brown, the world’s leading researcher in the science of play, states that “what play does better than anything else is unite what is in your head and your heart.” Celebrating play as one of the best exercises for the brain, he lists an impressive array of by-products including lightheartedness, empathy, hope for the future, optimism, flexibility, and adaptability, making a strong case for purposeful play in our classrooms. 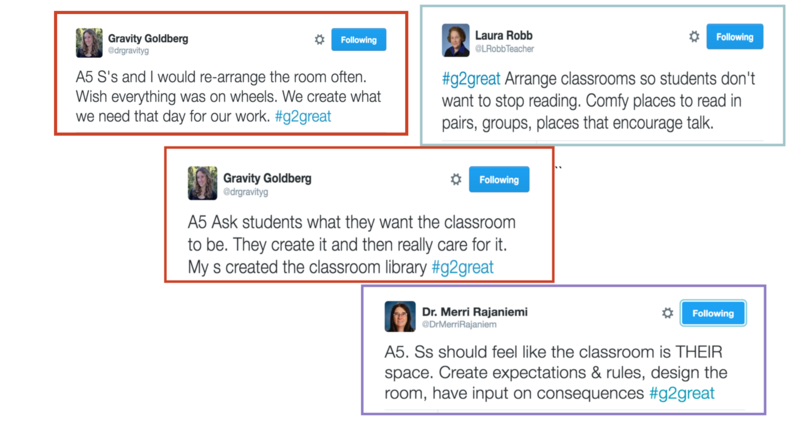 In a nod of enthusiastic support, our #G2Great chatters added a myriad of benefits including opportunities to discover, explore, negotiate, imagine, create, rehearse, problem-solve, revise, collaborate, engage, innovate, elaborate, persevere, cooperate, compromise and plan. Add social and emotional intelligence, growth mindset, motivation, choice, curiosity and flexibility to that lofty collection and the ‘necessity’ in purposeful play is elevated to a new sense of urgency. What makes Purposeful Play such a powerful book is that it is brimming with research support that inspires us to embrace purposeful play and affords ample evidence to convince naysayers while their treasure chest of tips and suggestions in a step-by-step illustrated guide transports us to a visual playground of pure joy. 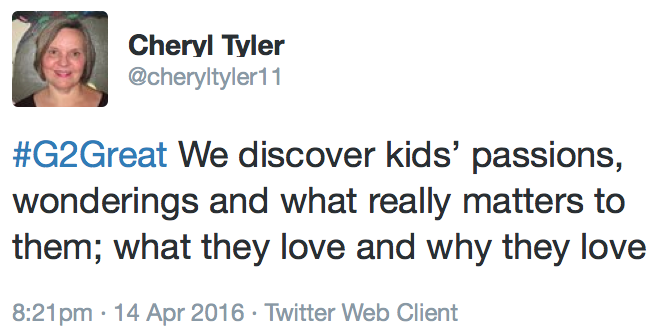 They don’t just tell us how to make purposeful play a reality – they show us. Purposeful Play is a magical mix of compelling research evidence and practical application that is sure to bring the play movement back into glorious view. This message comes at a time when far too many schools view recess and other forms of play as expendable in favor of an ever-increasing emphasis on academic rigor. In response, Kristi, Allison and Cheryl highlight the rigorous nature of play as ‘play in work and work in play.’ In or out of our classrooms, purposeful play engages children in enthusiastic ‘rigorous’ learning that can fuel our instruction to a new level. Our favorite new play friends remind us that although we may not have a choice in what we teach, how we teach is always in our hands. In others words, purposeful play as a personal and professional priority is a choice. 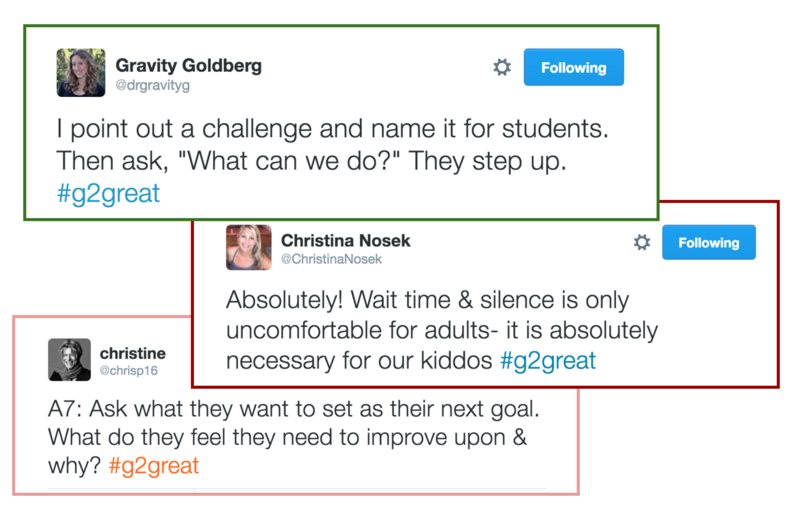 This week on #G2Great, with the gracious support of Kristi, Alison and Cheryl, our chatters made a conscious choice to make purposeful play a personal and professional priority and their excitement was palpable. Teachers left with a new resolve to embed purposeful play into every learning day. 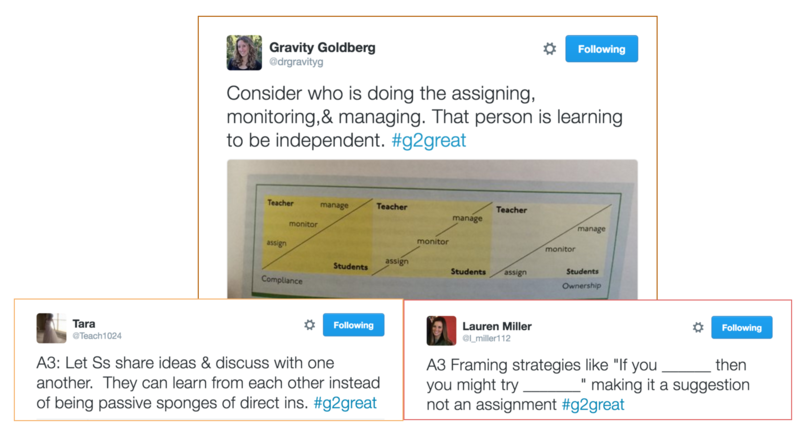 Best of all, our #G2Great Twitter playdate will impact our students and make them the lucky benefactors of their enthusiastic determination. Oh yes indeed girls. Let’s play! 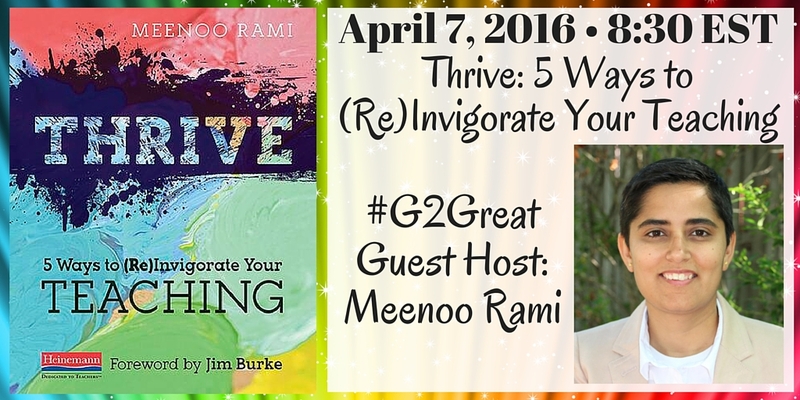 On April 7, 2016 #G2Great, we were lucky to have Meenoo Rami, author of Thrive, as a guest host on our Thursday night chat. Just as her book helps us to thrive in the professional work that we do, Meenoo’s message on the chat was that when we make our own learning a priority, our students in turn benefit greatly. Meenoo’s message supports Carol Dweck’s idea of growth mindset. Since the publication in 2006 of her book, Mindset, Dweck continues to remind us that we are actually on a continuum between fixed mindset and growth mindset. My friend @JDolci, an amazing educator, lifelong learner and questioner, illustrated this continuum when he was faced with putting together a complicated easel this week. He reverted into the “I am so terrible at putting things together” mindset but luckily used the growth mindset to assemble it (with the encouragement of our Voxer network). 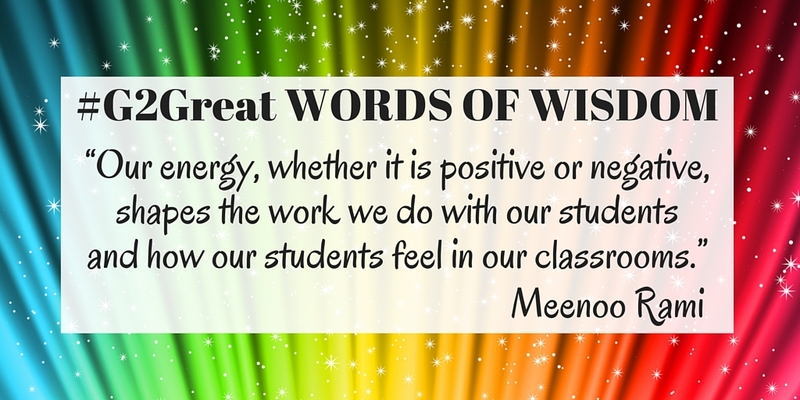 As we work to strengthen our professional growth mindset, Meenoo’s message helps to guide us. Her words give us a roadmap for our own learning journey. 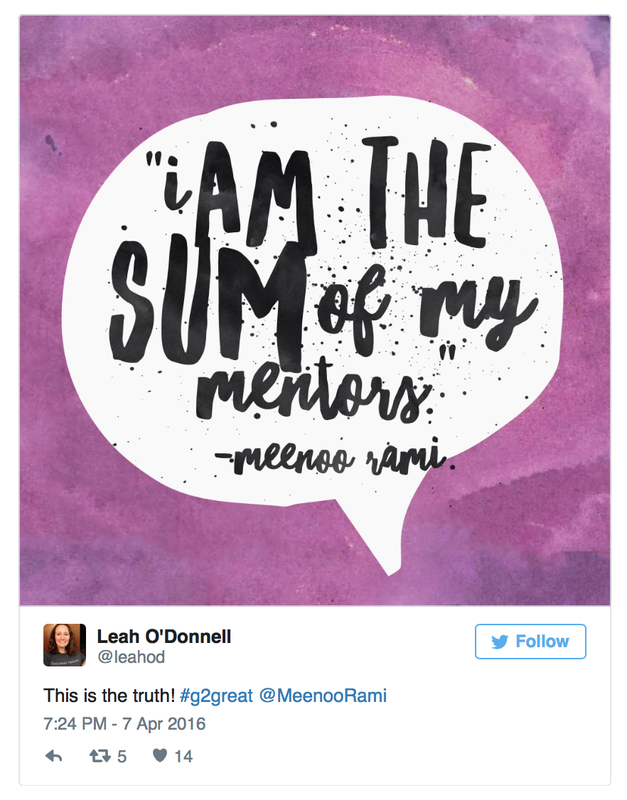 Meenoo’s tweet reflects a responsibility that we all have to reach out to others in the teaching community in order to help them grow. Thrive gives us a template to offer to teachers in our community. This message of mentorship is more important than it has ever been before because many teachers feel isolated. Meenoo encourages us to step outside the boundaries of our school environment to connect with a greater teaching community. A dear friend has been teaching for over 20 years. She goes to the end of the earth for her students but she hadn’t read a professional book in years and had no current mentor to look up to. By her own admission, she was stuck, isolated and bored. Her years of experience and successes in the classroom make her such an invaluable asset to her school community, but she lacks the spark, the drive and the community to help her grow. She was eager to learn but the PD her district offered never seemed to meet her personal learning needs. I shared with her that Twitter has provided me a platform where I can grow in the company of others. She was ready to break down those barriers. Meenoo suggests here that as mentors ourselves we don’t want to change others, only spark their own personal growth. She also clearly advocates that we all hold the roles of both mentor and mentee and she encourages us to help others learn and learn from others. Meenoo emphasizes the importance of being in a community of learners in order to thrive, but we each have to find our own path to accomplish this. Professional inspiration can come from many sources, including our students. Herein lies the great impact of Meenoo Rami’s book, Thrive. She gives us, the teaching community, a guide to help us all continue to grow and learn as teachers, no matter how long we’ve been in the field. She lays down the groundwork to be able to cultivate a growth mindset around our very important work. 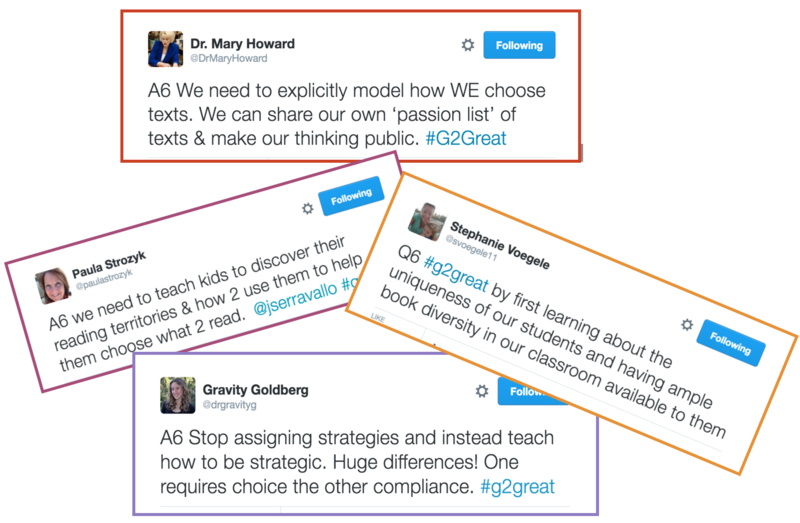 As guest host on this week’s #G2Great chat, Meeno shared her amazing wisdom with a group of eager learners. Her clarity in the importance of growing as educators beyond our comfort zone resulted in changes that could be felt in the course of the chat. During last night’s chat and in Meenoo’s book, Thrive, she reminded us of the importance of cultivating professional growth and curiosity which, in the end, greatly impacts our students. (RE) Invigorate your teaching with Meenoo’s newsletter and remarkable book, Thrive. Springtime makes promises: Yes more light will fill your days. Yes new life will color your landscapes. Yes your world has begun a shift to something new. Teachers are always on the lookout for signs of change. Our work is to learn how to cultivate growth, to understand its process, and to help it thrive no matter the context. We rest our hopes on a small but powerful word – yet. When teachers use a mindset that embraces the power of yet, they make promises: Yes I believe in you. Yes I will help you. Yes together, we will find the next step in the journey. Just as springtime makes promises, we also make promises to our students. Yes, we will help our students find the next step in their growth journey. We are in this together, take Gravity’s advice back to the classroom.